As your plane begins its descent towards Rome, off to the north you will often see a blue teardrop nestling in the hills of northern Lazio, with two tiny islands close to its southern shore. This is Lake Bolsena, Europe’s largest volcanic lake – only an hour from the capital. 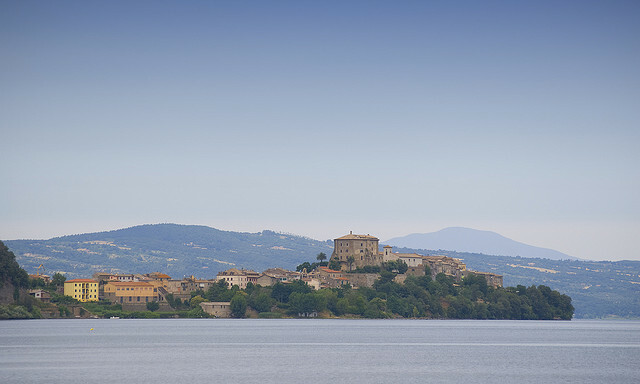 For those familiar with the lakes of northern Italy, Bolsena will be something of an eye-opener: far from being a mass tourism destination, this area is still largely unspoilt, with a rich heritage of traditions and history. The only essential item for this itinerary is a car. This will allow you to explore the region at your ease, without relying on the few available bus services. Then, along with your map, don’t forget to take your swimming costume. 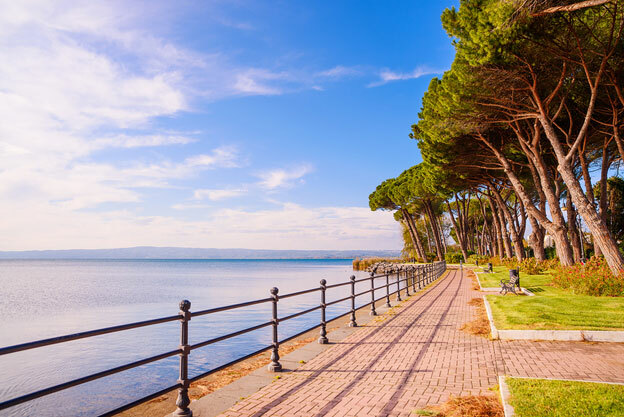 Thanks to an elaborate – and expensive – purification system, Lake Bolsena is one of Italy’s cleanest lakes so you don’t want to miss out on a swim. The logical starting point is the little town of Bolsena itself, on the northern shore. Arriving from either directions on the via Cassia or from the provincial road from Orvieto, Bolsena greets the visitor with the characteristic charm of a medieval village. Its attractive position on the slopes of the Volsini mountains has encouraged human settlement since Etruscan and Roman times. Leave your car in the parking space in the central Piazza Matteotti and start walking from there. A wander through the medieval town will help you to get to know the place: simply take Corso Cavour and then start your ascent to the Monaldeschi castle by taking one of the sets of steps on your right. It feels like going back in time: the narrow alleys, arches and buildings retain their medieval appearance. Very little has changed since the Lombards destroyed the town on the shore and the survivors built a new town up on the cliff. It is a stiff climb, but the view from the top is a reward in itself. You can visit the Castello Monaldeschi, built by people from nearby Orvieto between the 12th and 14th century. It now houses the Lake Bolsena Museum, which illustrates the naturalistic and historical aspects of the territory. If the weather is nice, you can go on a boat trip to the Bisentina Island. Just retrace your steps back to Piazza Matteotti and from there take Viale Colesanti, the plane-tree-shaded avenue that leads to the lakefront in just five minutes. The port is to your right (just next to a small bar where you can get a quick espresso or refresh yourself with an ice lolly). You can enjoy a 2-hour tour that includes a boat trip and a guided visit to the Isola Bisentina. A favourite retreat of the Farnese family in the 1500s, the island was acquired in the 1900s by the princess Beatrice Spada Potenziani, wife of the duke Fieschi Ravaschieri; her heir Giovanni Fieschi Ravaschieri opened it to the public. Apart from the string of Calvary chapels and the large domed church of Sts. Giacomo and Cristoforo, botanical studies have identified more than 230 different species of plants on the island. Very little has changed since the time when Popes, writers and aristocrats walked here and almost no sign of modernity can be found on this little island. Back in Bolsena by 12.30, you will probably have worked up an appetite by now. 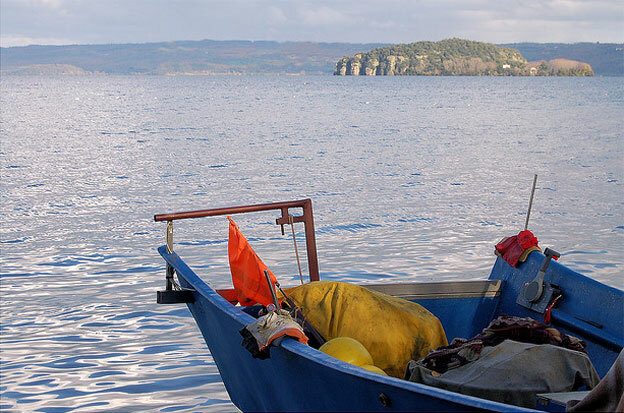 For fish lovers, Bolsena is a real paradise. The restaurants on the lake front offer a good choice at very reasonable prices. Try coregone in salsa verde (white fish in herb sauce) or the local eels, for which Pope Martin IV had such a fondness that he was placed in Dante’s Purgatory. After lunch, get yourself a good espresso and keep walking all the way down Corso della Repubblica and have a look at the Romanesque church of Santa Cristina, whose catacombs house the tomb of the young martyr. Time to go now. Back in the car, take the SS2 (via Cassia) to Montefiascone and from there follow the signs for Marta. Far smaller than Bolsena, Marta is located on the opposite shore and lies next to the point where the river of the same name flows out of the lake. Leave your car in the main square and explore the little alleys of the old town, which will take you to the tower that dominates the landscape. It is all that remains of the Fort built by Pope Urban IV in the 13th century, and its octagonal structure is unique in Italy. After that, back in the main square, take a walk to the lakefront and follow the yellow signs on the left to the villaggio dei pescatori, the area where the fishermen still live and work. Most of the people living in Marta are still either fishermen – especially for eels – or expert wine-makers who produce a limited amount of Cannaiola wine, a fine ruby red wine typical of the town. The town of Capodimonte is the final destination of our tour. Only 2.5 km from Marta, it is less than 5 minutes’ drive. Its lake front is the longest and perhaps the nicest of the lake, with beautiful walks, cafes and gelaterie and a great view of the old town up on a small promontory. You can stop by the lake, enjoy the atmosphere of the little port and watch the people going by, or explore the old town up to the Farnese Castle (closed to the public), built in the 16th century by Sangallo the Younger. From here there is a breathtaking view of the lake. As evening approaches, enjoy the sun set over the lake. There is something magical about it, a sense of the suspension of time. The problem is, you might love it so much that you won’t want to leave.